Happy Friday 🙂 How has your week been? All good, I hope? My week has been mad here. You know when you start one job, then another then your day to day jobs start mounting up? Well, that!! and more. I am exhausted today. I need a nice easy day and lots of cake. Yesterday I help set up my husband set up our Daughter’s new loft bed. 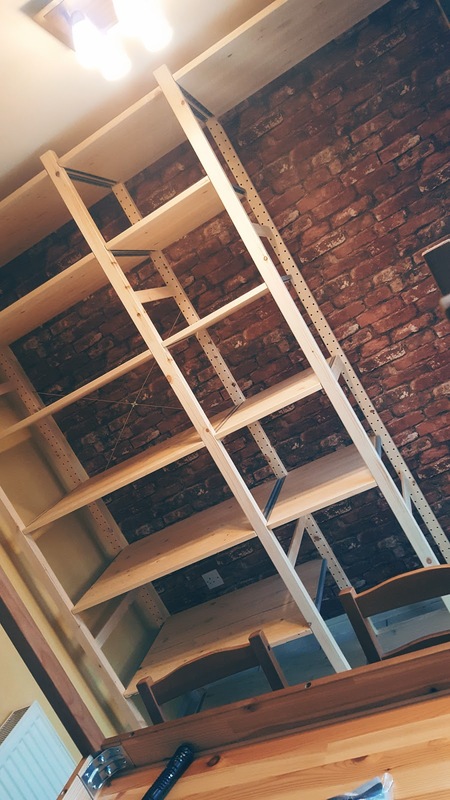 Then when he went to work, I put up a floor to ceiling wall length kitchen shelve set up. All by myself. Totally wore myself out. Hopefully, it will all be worth it in the end!?? Helping out eh Mollie? Or getting in the way? No worries, you look too sweet here. 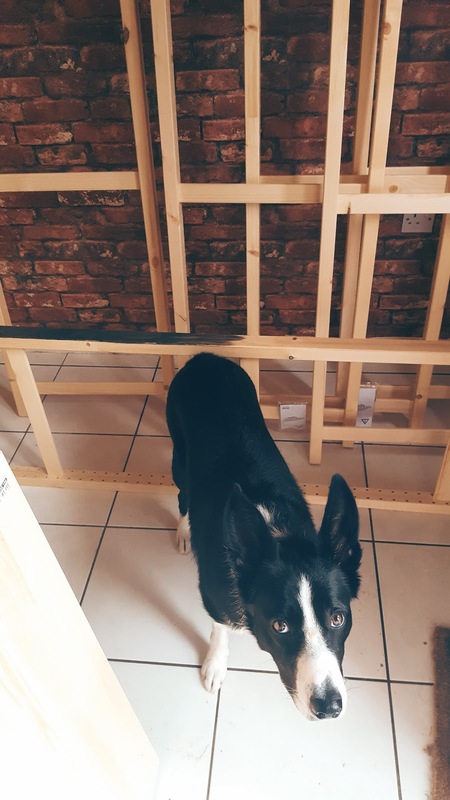 Hehe, Mollie loves to help out. So much still to do as I am staining it all black. I do set on some jobs for myself!! Now I wonder how many coats of black stain this will need to look good? Have you stained any shelves like this before? If so, what colour varnish did you use? Want to join in the weekend blog hop? Please follow your host, Claire Justine. Link up your favourite posts from this week, link straight to a blog page. You can link up to 5 posts on this weekend linky. 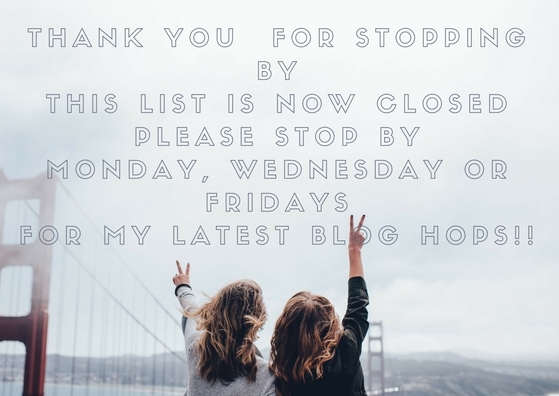 Please be kind enough to add a link back to this page somewhere in your post or you can add the weekend blog hop button if you prefer. Have fun visiting others and hopping around the party . 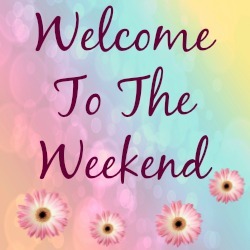 Remember you can Tweet me your links:#Weekendbloghop I will share you links. This blog hop has now expired. Pop back Monday, Wednesday and Fridays for a brand new link up. "Christmas Pudding And Sherry Cheesecake"
"Halloween Spice Biscuits: Frightfully Fun"
Thanks lovely, it is taking forever!! Thanks Ada, I've not posted an outfit post in ages due to decoration, but I will be back again soon 🙂 Thanks Ada..
Looks great so far! Good for you for tackling this project on your own. Enjoy your weekend! You built that yourself? Great job! Have a fantastic weekend. What a nice entry to your blog! Looks fancy schmancy! !And that shelf is nice :)) You're hard work paid off! Kitchen makeovers are nice especially when it's all done and looks great! Thanks for the link up! Good luck with renovating. Look forward to seeing it when it's finished. Good luck with this project. It is going to look great.